LEWIS has developed a best in class media measurement methodology that helps clients understand how media and PR campaigns can impact organizational objectives. The agency has adapted the International Association for the Measurement and Communication of Communication (AMEC) framework, principals and terminology to fit with the current PR professional’s measurement needs. LEWIS created a measurement model that keeps the most important set of KPIs, Business Performance, at the center of everything we do. For each LEWIS client, we offer exposure and engagement metrics as a component of any PR engagement. When that’s not enough, LEWIS research develops custom measurement projects to help clients map their PR activities to their overall business goals. Using analysis requirements, LEWIS offers a Structured Share of Voice (SOV) product that helps ensure a transparent and repeatable media measurement framework that will provide strategic insights for campaign management. Each requirement set will help define how the source, primary company and competitor will be measured using media aggregators. The requirements consist of source definitions and exclusions, primary company inclusions/exclusions and competitor inclusions/exclusions. All requirements should be reviewed at least semi-annually to ensure the measurement yields the proper results for strategy creation. Want to know how much value is created from your campaign efforts? Using media output metrics and company SEO/SEM data, the LEWIS Earned Impact metric can tell you the representative value of current PR campaigns within digital media. The metric tracks click through rates (CTR) and cost per click (CPR) information of targeted key word campaigns to provide an actual dollar value of your organizations PR efforts. Brands today are told that they need to be relevant at all times in order to maximize media and sales opportunities. At LEWIS, we know that all tech brands can’t be Google and all consumer brands can’t be Apple, but all brands should still be asking themselves “How has relevance impacted my customer’s buying process?”. Applying Just-in-Time (JIT) theories to media measurement, LEWIS created the Relevancy Quotient (RQ) to help brands understand when and how they can be the most relevant to efficiently target media and sales opportunities. The RQ is a combination of media monitoring and traditional primary research methods. We focus on the four areas that that are most important to brands when determining when and how to craft media messaging to targeted buying groups. 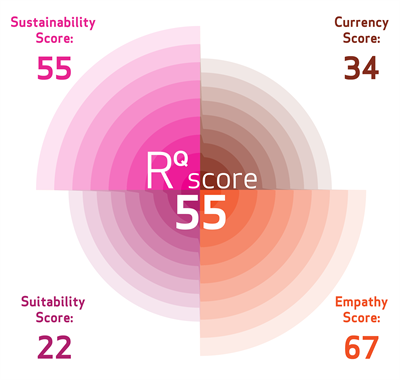 The RQ Score is developed by combining each of the four relevance areas with a dynamic weight that educates clients on current buyer perceptions and media content.